Cooper Lighting Metalux™ Collection HBLED Series LED High bay light in white enamel finish, has 104-Watt 80 CRI 4000K LED lamp to offer 12000-Lumens of light output. Lamp has voltage rating of 120 - 277 Volt. Lamp has average life of 60000 hours. Light with 0 - 10-Volt dimming driver, is suspension mountable. It measures 48-Inch x 20-Inch x 2-3/8-Inch. It withstands temperature range of -20 to 55 deg C. It is suitable for industrial, commercial, manufacturing, gymnasium and other applications. 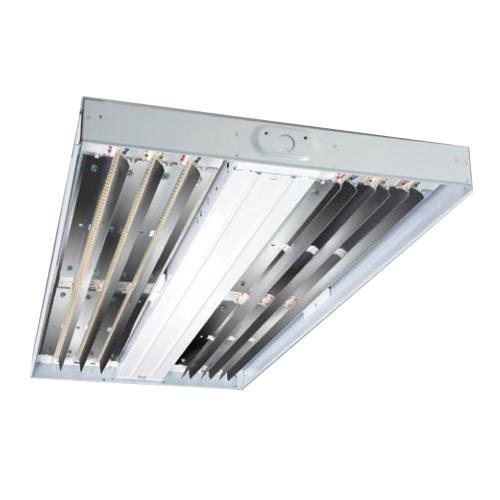 LED High bay light is cULus listed and RoHS compliant.